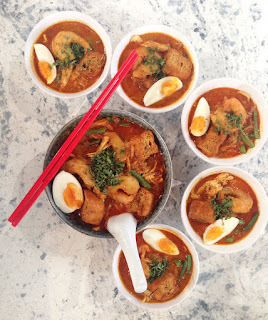 Sambal Shiok, Mandy Yin's Malaysian street food and pop-up, is starting a new residency at Blend Cafe in Green Lanes, N8, on Tuesday 25th October. Serving from Tuesday to Saturday, from 5.30pm - 9.30pm, they will be serving their amazing Laksa, plus other delights - try the dumplings! - and it's sure to make the locals happy. Mandy's had an amazing year, including pop-ups at Salvation in Noodles and The Sun & 13 Cantons in Soho - and I'm so pleased that Sambal Shiok has found another home! "Mandy Yin and her team are bringing their signature laksa noodle soup to Harringay Green Lanes this winter. Blend will welcome them from Tuesday 25th October 2016 for six months. This residency follows on from Sambal Shiok's sell-out runs at the Newman Arms, Salvation in Noodles Finsbury Park and The Sun &13 Cantons Soho. &quot;I am excited to be coming back to North London, especially Green Lanes, as the first market to give me a chance was Harringay market when I started the business three years ago, says Mandy. Linda Zubairi of blend says "We've been fans of Sambal Shiok ever since their Harringay market days and actually followed them around to their various locations. So we couldn't be happier to be able to bring this gem back to Harringay. With their focus on excellent food and super nice team Sambal Shiok are the perfect fit for us at blend and will make a real difference to Green Lanes at night. Sambal Shiok will be serving dinners daily between 5.30-9.30pm Tuesdays to Sundays, closed on Mondays. They will be operating on a walk-in only basis but will accept bookings for groups of 6 or more. For group bookings, please email sambalreservations@gmail.com. Takeaways will be available for collection or using deliveroo."